Outside of signing a home mortgage contract or driving away in a new vehicle, the decision to buy a mattress represents the most important consumer purchase you can expect to ever make. Mattresses typically outlive cars and what good is the master bedroom in a new home if the bed does not lull you to sleep. Most sleep experts agree the human body needs at least seven hours of restful sleep per night to rejuvenate our mental and physical powers. If you live to the average human age of 78, you will have spent 26 years of your life in slumber. Therefore, it is important that you take the time necessary to complete the mattress buying process. Two high-end mattress brands have earned the reputation for delivering superior quality mattresses. In addition, both PlushBeds and Avocado mattresses address another concern a growing number of consumers have not only about mattress quality but also about sustaining the environment. Both mattress brands have implemented eco-friendly practice to design and manufacture what is called “Green” mattresses. 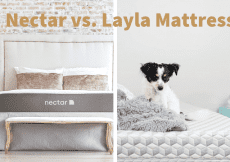 In this comparison article, we test the signature PlushBed and Avocado mattresses to determine which mattress is the right one for you. First, we present the factors you should consider before buying a mattress. At the end of our comparison article, we offer a few tips to help you bring home the mattress that gives you at least seven hours a healthy night’s sleep. In one way, buying a mattress is similar to buying a car or home. We have unique sleep preferences, which mean the factors we use to judge different styles of mattresses also differ. Another point to think about concerns how we change our sleeping preferences as we grow older. The super plush mattress that hugged our body when we first started out in the workforce is no longer the mattress solution for someone who needs firm back support. You might have been a side sleeper all your life until one day, you woke up to find yourself lying on your back. Despite the myriad criteria we use to make mattress buying decisions, five factors should be included on every consumer’s list. How you prioritize the factors is up to you. You probably have heard the expression “What’s good for the goose isn’t good for the gander. Well, when it comes to mattress comfort, what’s good for one consumer might not be good for the consumer standing in the same bedding customer service line. Mattress comfort takes into consideration several features that include bounce, temperature, edge support, and motion transfer. However, the firmness level of a mattress sets the comfort tone. Mattress firmness ratings start at plush and cross the spectrum to very firm. The one to 10 firmness scale helps consumers find the right mattress. For measuring comfort, mattress manufacturers do not use a scale. Instead, mattress manufacturers direct consumers to a color-coded chart that indicates different definitions of comfort. No other mattress factor buying factor is as important as comfort. We mentioned temperature in the comfort section, but this mattress buying factor deserves its own write-up. Your body temperature changes during sleep. Most sleepers start off at normal body temperatures and remain there until the beginning of the transition from light to REM sleep. The body warms up and at times, a mattress that traps body heat can create an uncomfortable sleeping environment. Mattress manufacturers insert cooling gels into memory foam to help “hot” sleepers feel cooler under the sheets. Another sleeping characteristic that changes as we grow older is many of us tend to sleep cooler than we did in our youth. Mattress manufacturers target older sleepers that sleep cooler than what is comfortable by inserting a fourth layer between the top and middle layer to trap body heat. Although mattress size is not the most important buying factor, it should be one of the first factors you determine. Mattress size refers to the width, with twin and full mattresses accommodating one person. Couples typically start the mattress buying process considering queen, king, and California king size mattresses. If you sleep alone and move around during slumber, a twin or full-size mattress might be wide enough to control your movements. We recommend Queen size and up mattresses for adults, even for adults that sleep alone. You might gain a partner and instead of spending money for another mattress, a queen, king, or California king mattress provides plenty of room for both of you. We are not asking the common question of “How did you sleep last night.” Our interest stems from knowing the sleeping position you like to start a night of sleep. Notice we said “start.” Most of us change sleeping positions several times a night, with many of the changes subtle ones that happen while we are in one of the three primary sleeping positions: side, back, and stomach. For example, you might start on your back with both arms at the sides of your body. Eight hours later, you find your arms crossed on the chest. Softer mattresses that come with firm edge support are good options for side sleepers. Back sleepers typically like to sleep on firmer mattresses. If you sleep on an uncomfortable mattress, you run the risk of flaring up pressure points located at the neck, back, hips, and shoulders. Many mattress manufacturers promote memory foam that prevents neck, back, hips, and/or shoulder pain. As a recent mattress design trend, new technology has allowed some manufacturers to tout mattresses for relieving pressure point pain. Not only do a few mattresses alleviate pain, the same mattresses incorporate allergen free fabrics that prevent the level of sneezing and wheezing that keeps you up all night long. PlushBed wants to capitalize on the dissatisfaction many consumers have with latex mattresses. 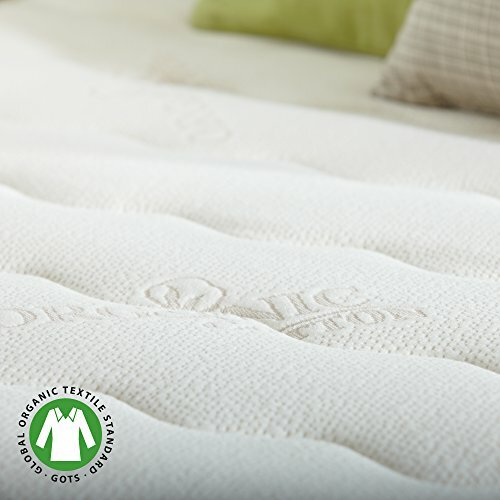 The mattress company recently introduced the Botanical Bliss mattress, with the goal to design a high-end mattress that provides “top-notch comfort, support, cooling, and bounce.” PlushBed has set the standard by receiving the highly coveted GreenGuard Gold certification. Third party tests confirm the company has exceeded the chemical emission standards set by GreenGuard. PlushBed mattresses reduce indoor air pollutants, lower chemical emissions, and produce a much healthier sleeping environment. We applaud PlushBeds for its commitment to sustaining a healthier indoor environment. The question left to answer is how does the Botanical Bliss mattress perform? PlushBeds approaches the design of a latex mattress a little bit differently than its competitors. Most latex mattresses consist of one, maybe two layers of latex foam. A couple of manufacturers design mattresses that feel like latex foam, but contain another type of material. PlushBeds designs the Botanical Bliss mattress with 100% latex foam from the top of the mattress to the bottom of the foundation layer. Another unique feature offered by PlushBeds is the different thickness options, which range from nine inches to 13 inches. The top layer contains one-inch of blended Joma wool and organic cotton intended to deliver optimal pressure point relief and a cooling effect that releases the body heat trapped by “hot” sleepers. Joma wool also bolsters the fabric’s fire retardant capability. Three inches of smooth Talalay latex comprises the middle layer. The middle latex layer provides the first layer of support to give the Botanical Bliss mattress excellent recovery time. Body impressions quickly fade and the middle layer pushes the top layer to hug the body. The foundation layer contains six inches of ARPICO organic latex, which is a 100% natural by-product of the sap squeezed out of rubber trees. Six inches of sturdy latex provides additional firm support for the three-inch middle layer. Designed with 100% organic cotton and a wool layer knitted under it, the cover offers both a super soft feel and uncompromising breathability. With most covers fabrics woven together, PlushBeds once again breaks the mattress design mold by knitting the organic cotton cover with the wool underlayer. Circular knitting prevents wrinkles from diminishing the quality of the stylish cover. You can stretch the cover tight and when you release the fabric, it moves back to its original position. Knitted covers are softer than woven covers and we definitely noticed the difference with the knitted Botanical Bliss mattress cover. Not only does wool act as a reliable fire retardant, it also absorbs moisture from the skin to keep you comfortably cool all night long. Another unique feature offered by PlushBeds is the four firmness options for the Botanical Bliss mattress. The mattress company allows customers to select among soft, medium, medium-firm, and hard. Ranging from 3.5 to 10 on the mattress firmness scale, the four PlushBeds firmness options cover most of the support bases. All that is missing is a very soft firmness rating. When you first assume your preferred sleeping position, you should immediately feel soft comfort and the contouring of the first layers. After the middle layer delivers its bounce recovery, the base layer takes over to keep the back straight. The contouring feels different for latex foam mattresses than it feels for a memory foam mattresses. With memory foam, you experience more defined contouring, especially around the hips and shoulders. Latex foam creates more rounded contouring that feels like the latex foam molds around the body. The rounded contouring seems to do a better job of relieving pressure points than the sharper contouring delivered by memory foam mattresses. The PlushBeds Botanical Bliss mattress sits at the top tier of mattresses in terms of bounce. In addition to helping the top layer recover from body impressions, the incredible bounce is also a benefit for couples in search of ways to spice things up in the bedroom. Even with above average bounce, the Botanical Bliss mattress does not produce much motion transfer. The unique and highly effective design of the PlushBeds Botanical Bliss mattress has created price points that rank as some the highest price points in the bedding industry. PlushBeds offers a promotional code “SLEEPOP5” that customers access from their cell phones to receive a $50 discount on the purchase of any size Botanical Bliss mattress. Shipping is free and the mattress arrives to your home in a compressed box within seven and 14 days. The warranty runs 25 years, with the first 10 years considered full replacement and the next 15 years prorated to cover mattress indentations greater than 1.5 inches. Customers find out if the Botanical Bliss is the right mattress by participating in the 100-day free home trial program. We want to remind readers the PlushBeds Botanical Bliss mattress is extremely difficult to move because of its floppy nature. 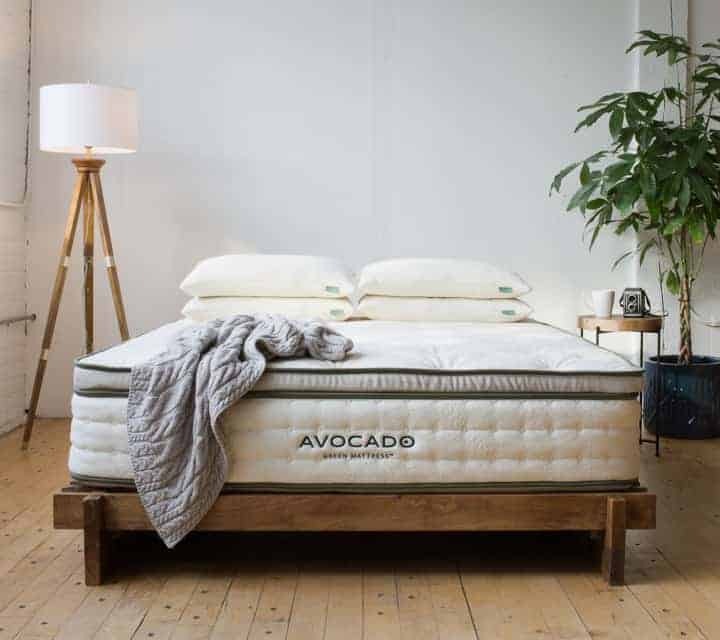 Avocado is a newcomer to the mattress industry, has unveiled the design of its signature mattress in 2015. The mattress company hand designs and manufactures the mattress in California. 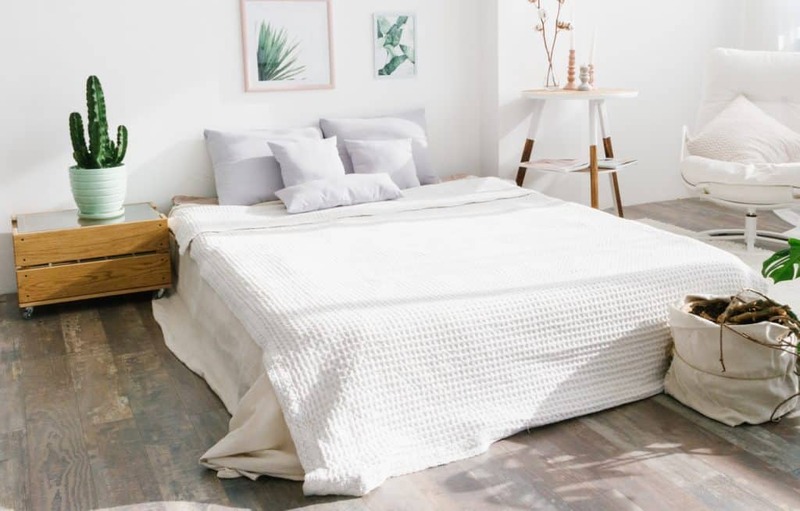 Without using petroleum-based polyurethane foam, Avocado has also received the GreenGuard Cold certification for integrating organic materials into the construction of its flagship mattress. The Avocado mattress also does not include dangerous pesticides and toxic flame retardants. The top layer of the Avocado mattress contains 100% natural Joma® New Zealand wool to enhance breathability, as well as regulate body heat to achieve the optimal sleeping temperature. Joma wool acts as a natural fire retardant and its moisture-wicking properties ensure you remain comfortably dry throughout the night, even if you are considered an active sleeper. Four inches of eco-INSTITUIT certified, 100% natural Dunlop latex follows the top layer to offer dependable support for any sleeper who suffers from nerve induced lower back pain. Unlike Talalay latex, Dunlop latex does not have any chemicals added during processing. Avocado gives PlushBeds a run for the innovation award by placing an eight-inch innerspring unit at the foundation of the mattress. Manufactured in the United States, the eight inches of innerspring support features three targeted sleeping zones, as well as a reinforced perimeter that delivers superior edge support. Considered one of the most supportive base layers available in the mattress market, the foundation layer allows the coils to float independently to increase airflow and reduce motion transfer. Independently floating support coils also do a better job of conforming to different sleeping positions than a standard memory foam foundation layer. At the bottom of the Avocado mattress is a one-inch layer, which bolsters the firm support of the coils. 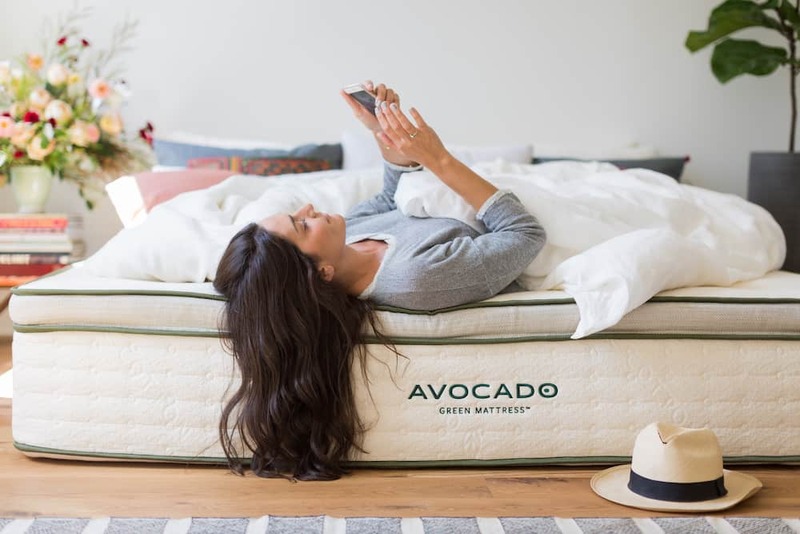 When you lay down on the Avocado signature mattress for the first time, you will immediately notice you are lying on a one-of-a-kind mattress. The hand-tufted buttons encircling the cover are much more than attractive design elements. Avocado uses the durable cover buttons to keep the different layers secure to prevent motion transfer during sleep. Wool yarn secures the cotton ticking to eliminate the need to use chemical adhesives. We view the cover buttons as a type of anchor that pulls the wool yarn through each layer of the mattress. If you turn the Avocado mattress over, you will see the anchors located under the mattress where the end of the wool yarn is tied. The cover design prevents the fabric from bunching to deliver supreme sleeping comfort. A visually appealing blend of lighter and darker green hues reflects the eco-friendly message Avocado wants to convey to its customers. Four inches of Dunlop latex divide into three sections, with each section offering different firmness levels. The different sections of firmness should appeal to consumers who slightly change sleeping positions as the night unfolds. By referring to the indentation load deflection (ILD) that runs from super soft at 12 to very hard at 50, we find the first layer of Avocado mattress has an ILD between 14 and 19. The low IDL puts the first layer of the Avocado mattress on the soft end of the mattress firmness scale. However, subsequent layers firm up to provide plenty of support for back sleepers. Avocado places the three different firmness zones in areas that provide incredible support for the back, hips, and shoulders. The zoning strategy focuses on ensuring difficult body areas such as the lumbar and pelvis receive the most support. However, the three strategically located firmness zones do not offer much support for the neck. Although the right pillow should contour around the neck, most mattresses include firm support at the foundation layer that pushes up the first layer to conform to the shape of the shoulders and upper back. Firm support for the shoulders and upper back translates into firm support for the base of the neck that rests just off most pillows. Consumers that opt for 100% organic products typically pay more at the cash register. For example, PlushBeds does not offer any of its mattresses for under $1,000, with the king and California king going for more than $2,000. Avocado maintains lower price points by using a manufacturing process that maximizes efficiency. The result is lower prices for each of the company’s different size mattresses. With an avocado California king mattress costing nearly $1,000 less than the cost of a PlushBeds California king, consumers must decide if there is a quality difference worth $1,000 between the PlushBeds Botanical Bliss and signature Avocado mattresses. Avocado offers a 100-day free home trial, which is about the average length mattress manufacturers offer for free home trials. 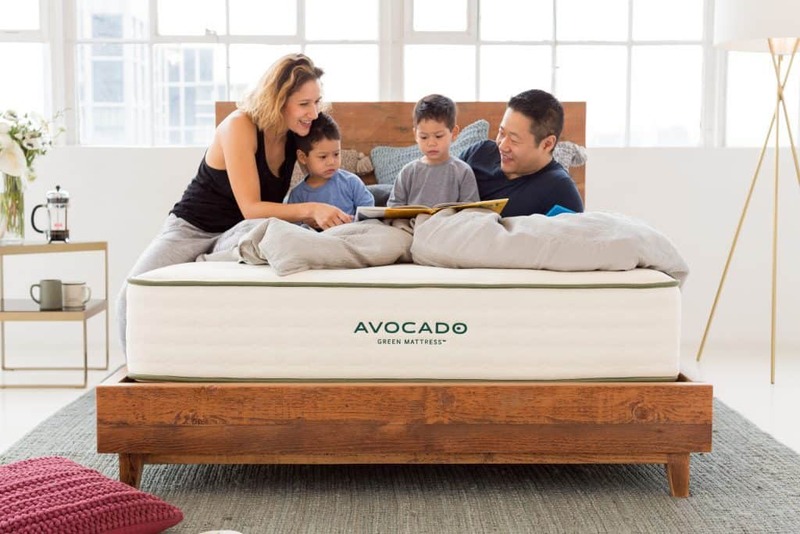 The Avocado mattress warranty covers defects found in materials used to design the mattress, as well as any shoddy workmanship, for a period of 25 years. This is one of the most generous mattress warranties offered by any manufacturer in the bedding industry. PlushBeds offers a world-class mattress designed and manufactured with all latex foam, which is a unique trait for a mattress to have. The company offers customers the choice of four different firmness levels ranging from super plush to very hard. This means PlushBeds capture a wide variety of customers that sleep in every conceivable sleeping position. 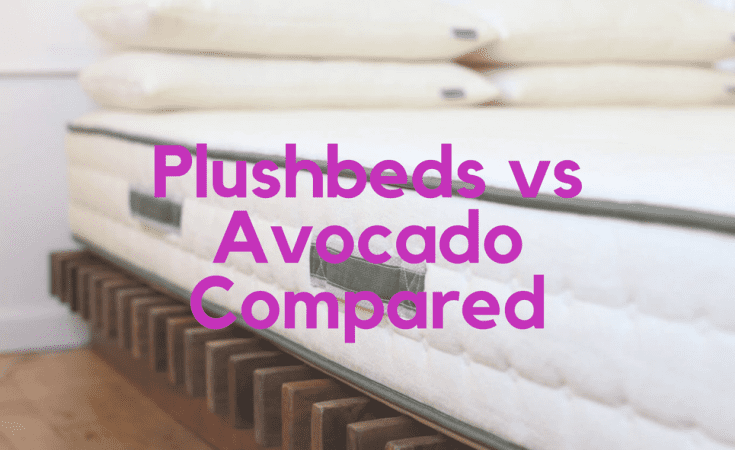 If this was a comparison article between PlushBeds and any other mattress manufacturer other than Avocado, PlushBeds would win the comparison. However, Avocado beats PlushBeds in virtually every mattress feature category. 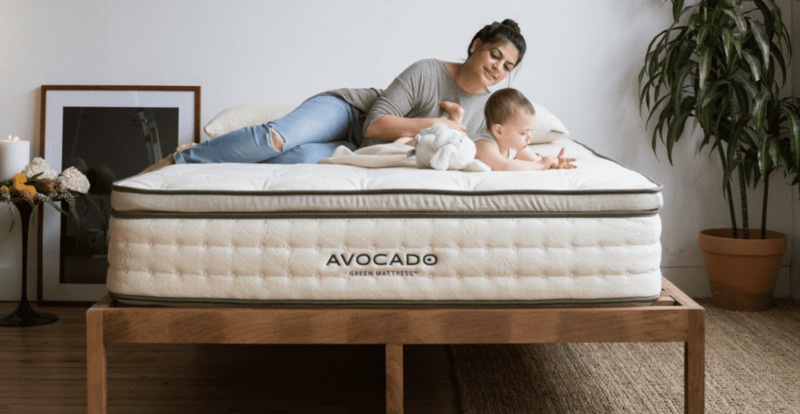 If we considered all features equal between PlushBeds and Avocado (and we do not), then Avocado still wins the comparison review because it costs significantly less to purchase the signature Avocado mattress. 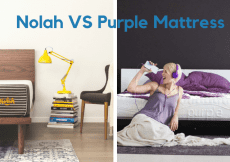 With PlushBeds selling the king and California king mattresses for more than $2,000, consumers have to go with a superior mattress that costs less money. Avocado offers a super soft cover that secures to the bottom layer by attaching the buttons sewn into the fabric. This means no fabric bunching and hence, a more comfortable night’s sleep. Support coils work independently to ensure the top layer relieves all pressure points. The Avocado mattress lacks a little in the support of the neck, but that is something a high-performance pillow can deliver. Save money, as well as enjoy superior comfort and support, when you buy the Flagship Avocado mattress. Since both PlushBeds and Avocado operate as direct factory mattress manufacturers, you probably will not have the option of testing out either mattress. However, with both companies offering 100-day free home trials, you have plenty of time to make up your mind. We recommend you perform research online for both mattresses, with special attention paid to customer reviews and the write-ups presented by bedding industry experts. One of the most important mattress buying tips involves thoroughly reading the buyer agreement. You want to confirm the manufacturer delivered the correct size mattress. Examine the condition of the mattress before signing on the dotted line. You do not want to sign for a mattress that arrives in less than mint condition. Above all, make sure there are not any stipulations in the agreement concerning the warranty and verify how each company handles refunds. Some companies issue full cash refunds, while other companies require customers to take credits on the purchase of another mattress offered by the manufacturer.